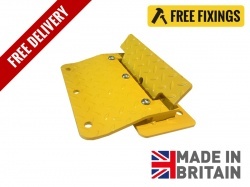 Flowplates Ltd are specialist manufactures of flow plates and directional traffic equipment. 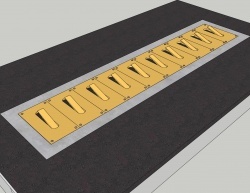 Our experience within the industry is unparalleled and as such our team have been manufacturing flow plates for the past 12 years which means that when it comes to providing the correct solution and the right product Flowplates.co.uk should be your only choice. Our manufacturing process is 100% kept in-house, no aspect of our fabrication is outsourced. We have an impressive factory with just about most fabrication equipment going. This means that we can constantly work on new ideas and great designs. All of our products are 100% British made. 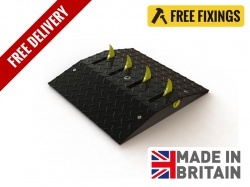 HGV, standard flow plates and traffic control plates are an effective way of controlling traffic flow and direction in car parks, business facilities, housing complexes or anywhere with low, medium or high traffic areas. 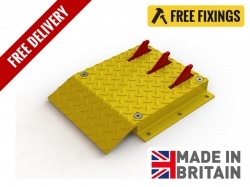 Flowplates.co.uk offer the largest selection of flow plate products within Europe that provide different solutions to traffic flow regulation. 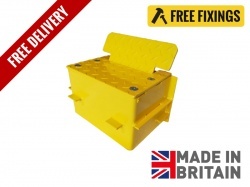 All of our products are manufactured in the UK from various gauges of mild steel depending on its weight requirements and powder coated (European Standards BSEN13438 and BSDEN15773) in yellow to ensure maximum visibility. We strongly recommend that speed humps and road signs are used in conjunction with the traffic flow equipment, and the goods news is that we also supply these products. We are certain that you will find what you are looking for with Flowplates.co.uk. Contact a member of staff for complex or large scale projects or alternatively simply order on-line. .